The mister and I are celebrating 15 years of wedded bliss by returning back to our honeymoon spot of New Orleans. We'd like to have a nicer dinner for our anniversary. No special snowflake requirements other than he doesn't want to bring a suit. Ideally, we would like to have a good dinner, one that isn't rushed and where we can enjoy some cocktails or wine. Some place that is a good experience and/or has a great view is also good. We will be taking Uber or a cab. One of the best meals of my life was at the caribbean room in NOLA. I wore slacks and they loaned me a jacket I believe. If they still have it, the Pompano en Papillote was exquisite! I had brunch at Atchafalaya recently on the recommendation of a local bartender (speaking of if you want a low-key beer at any point, The Black Penny is fantastic), and it was unbelievably good for both cocktails and food. And very not-tourist-y. We sat at the bar and our bartender/server was a total sweetheart and let us tastings of expensive mezcals for free when she learned I'd never had any. People were dressed medium casually but nice -- jeans and a button down and tie would be perfect. Highly recommended. We've eaten at Nola's a couple of times now and it has never disappointed for memorable and delicious experience. It's one of Emiril's restaurants and it's relatively casual. I love that city, and I love the old-school New Orleans restaurants more than the new crowd (which is weird, because I absolutely chase the new and novel ahead of local institutions in pretty much any other city, but there you go). There's a mess of these classic, venerable New Orleans restaurants, many with names you know, like Arnaud's, Commander's Palace, Brennan's, K-Paul's, etc. But this reply is about my favorite. If you want old-school New Orleans charm, you cannot go wrong with Galatoire's. The only caveat here is that I think they still want a jacket on men -- not a suit; just a jacket. And no tie required. However, they keep some to loan, if you show up without, so you wouldn't need to travel with it. It's at 209 Bourbon, which is close enough to Canal that Bourbon isn't really Bourbon Street yet. It's changed a lot since I started going with my parents in the late 1970s; it used to just be a downstairs dining room with a strict dress code and, for far longer than you'd think, a cash only payment policy (unless you rated a house account). They started taking credit cards sometime in the mid-90s, if memory serves. During Katrina (but not because of it) they renovated, and now there's an upstairs dining area and bar, and in the upstairs area they do I think take reservations. Downstairs remains first-come, first-served, and before they renovated -- when that was the only dining area -- you'd see a line of folks out the door, waiting for tables. Nowadays, they take reservations for upstairs, and folks waiting on the famous downstairs dining room wait in the bar. Downstairs is where you want to eat; that's the Experience, so to speak. The room is nearly unchanged, so it's a little like a time capsule -- locally grown waiters who work there for decades, unfussy, efficient service, and food that's both amazing and amazingly rich. 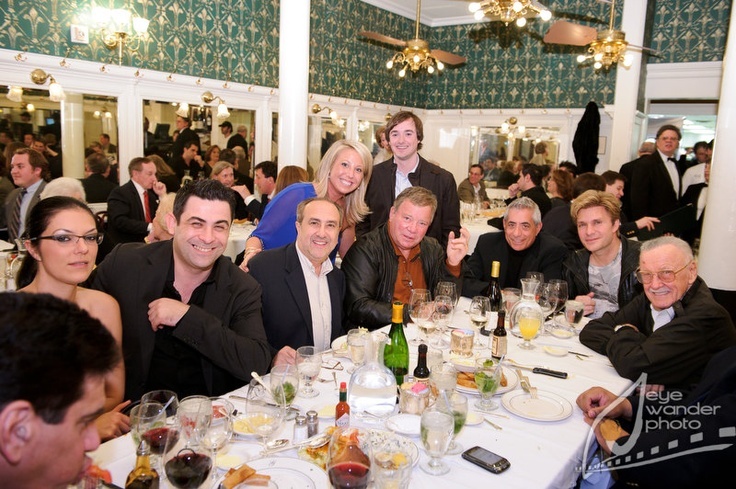 You know that picture of Stan Lee and William Shatner at dinner that's all over the net? It was taken there. It's also more a cocktail place than a wine place (may I suggest a sazerac?) but their list is competent and priced fairly. You will NOT be rushed. It's not quiet, but you can definitely have a lovely meal and real conversation. I try to get there at least once a year. Upperline Restaurant has great atmosphere, amazing staff, and while the food isn't particularly unusual for New Orleans it's very well done. It's not in the French Quarter but easily accessible by uber, cab, or streetcar. I live in NOLA and love food... Your criteria is not sufficiently narrow for me to give even a small number of suggestions. I haven't been in a restaurant yet that required a suit. New Orleans is small enough that the entire city is accessible by reasonably-priced Uber. Adolfo's - Little known Italian nook above the ruckus of Frenchman St. Commander's Palace - The iconic spot for this sort of thing. A coat for dinner is recommended but no need for a full-fledged suit. Service level is stratospheric. If you have more constraints and/or preferences, let me know via MeFiMail, I love this stuff! Oh my gosh if you go to La Boca you have to get a bottle of delicious South American red wine, the provoleta appetizer, and the skin on skirt steak which is so much more amazing than those words could possibly imply. It's not, you know, New Orleans or Cajun or Creole or French, but it is a phenomenal food experience where you won't feel underdressed in the clothes you've described. Since everyone's commenting with old-line restaurants and faithful standbys I'll jump in with some newer stuff (though I can recommend pretty much everything on milqman's list). - Toups' Meatery if you're looking for how true cajun folk might dress up some fantastic meats. - Rosedale, if you want Susan Spicer's incredible food served in a nowheresville neighborhood in an old jail building. - Cane & Table for world-class cocktails and an inventive Caribbean-influenced menu. - Balise for some hip and modern atmosphere to back up a vegetable-heavy (but by no means vegetarian) selection. - 1000 Figs for a falafel food truck that got its wish and turned into a sitdown joint. but basically, if you throw a rock you should be able to hit a restaurant that's been open more than two years and therefore is probably serving some top-notch food. Galatoire's is also an acceptable answer. Oh, while you're at it, no matter where you go for dinner, head to The Sazerac Bar and have a Ramos Gin fizz before you do. The bar is a beautiful antique in itself and the cocktail is one of the best I've ever had-- and since it's creamy white and full of foam it seems extra celebratory for a wedding anniversary. Had a great meal last month at The Munch Factory. The one in the Garden just off Magazine. Kind of casual chic. milqman's last recommendation is Commander's Palace and I have to second that. My wife and I ate there this past year for our own anniversary and as you would expect from a historic restaurant, the food was fantastic and the service impeccable. They will expect you to wear a coat at the very least. If he is dead set on not wearing one, then check out Josephine Estelle in the Ace Hotel. Its more low key, but still amazing food and very fun cocktails. We ate with friends there the night before we ate at Commander's Palace. If you have time, eat at both! Best fancy gumbo and wine list I found in the city was at R'Evolution in the Quarter. No dress code, fantastic entrees, and a crazy jewelry-box-full-of-chocolate at dessert.